The People’s Democratic Party (PDP) practically took the verbal war in the 2019 presidential campaign to President Muhammadu Buhari’s strongest support base, the North West, yesterday, when the opposition party launched its presidential campaign in Sokoto State. The party’s presidential candidate, Alhaji Atiku Abubakar, urged Nigerians not to fall for Buhari’s deceptions and that of his party, the All Progressives Congress (APC); in their quest to seek a second term. Atiku described president Buhari as a ‘failed’ farmer who could only boast of 150 cows, in his livestock business and that his policies have not lifted Nigerians out of poverty. The former vice president spoke in Sokoto, yesterday, when he addressed party supporters who attended the flag-off of his zonal campaign rally and presentation of the party presidential flag. He was accompanied to Sokoto by his running mate, Mr. Peter Obi, and the party apparatchik, led by the immediate past President, Dr Goodluck Jonathan, his deputy, Namadi Sambo, former governors, Senator Rabiu Musa Kwankwaso (Kano), Attahiru Bafarawa (Sokoto), Sule Lamido (Jigawa),Liyel Imoke (Cross River), Ibrahim Shema (Katsina), Gbenga Daniel (Ogun) and Babangida Aliyu (Niger). Also, Doyin Okupe, Tanimu Turaki, Mukhtar Shagari, BoT chairman, Senator Jubril Wali, Taraba State Governor, Darius Ishaku, among other party stalwarts were at the rally. There, Atiku said despite failing Nigerians on their campaign promises, the APC-led government has continued to deceive Nigerians in their bid to secure a second coming. He promised that if elected as president, his priorities include job creation and bringing peace into country. Atiku also said his bid for presidential contest was not borne out of a contest between him and his main challenger, President Muhammadu Buhari. Atiku eulogised the political value of the North West. “The Northwest has been the foundation and pillar of PDP where we have the people and support,” and dispelled insinuations that PDP supporters in the northern states have dwindled; ahead of 2019. Addressing a mammoth crowd of jubilant supporters drawn from Sokoto Katsina, Kebbi, Zamfara, Kano, Jigawa and Kaduna; the seven states that make up the North West, at the Shehu Kangiwa Square, Sokoto, Secondus said Buhari has failed the people woefully. Secondus said the PDP has chosen a credible and experienced presidential candidate and his running mate, Peter Obi, to lead the rescue mission. “Atiku has what it takes to turn the economy around, create jobs for our teeming youths and unite the country,” he said, and warned that Nigerians have turned their back on the APC and president Buhari as could be seen by the people of Sokoto and the North West states. 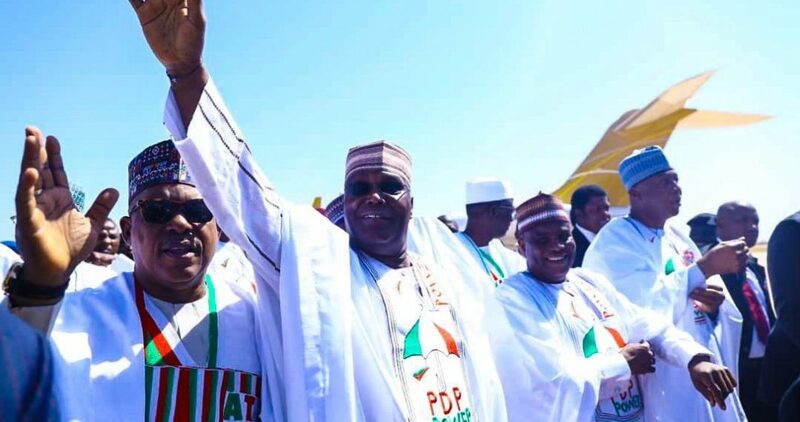 The highpoint of the rally was the presentation of the party flag to Atiku, Obi and the Sokoto state governorship candidate, who is also the state Governor, Aminu Tambuwal. Speaker of the House of Representatives, Yakubu Dogara, said Nigeria should be grateful to democracy for providing the opportunity for the people to make changes when things are not going well. Dogara said he and some other Nigerians fought for change in 2015 but have since realised that the change was not forthcoming, hence, the decision to dump the APC for the PDP. On his part, Director General of the campaign council as well as Senate President, Dr. Bukola Saraki urged the North West to lead the way in the huge mission of rescuing the country. “As the DG of the campaign, when we said we wanted to come to the North West, they said it is a no-go area for PDP but, today (yesterday), the North West is PDP! Today, North West is speaking for PDP, because they told us it was a no go area. Alhamdulillah Robilalamin (Glory be to God) that today, you have shown you are ready to go PDP. Saraki assured Atiku would be voted for because he understands how to make the country better. “The man that can bring food to the table, the man that can fight security, the man that can unite Nigeria, Atiku Abubakar! It is about food, security and we will vote Atiku Abubakar because he understands it, he knows how to make good choice, he knows how to make things work, he knows how to unite Nigerians, that’s why we will vote him. “We have tried this one (Buhari), but he has failed. North West has spoken and the entire Nigerians will speak,” Saraki said. The high points of the zonal rally was the unique prayer offered by Atiku, at the grave side of the father of the Caliphate, Mallam Uthman Dan Fodio. The prayer was symbolic as the tomb is hardly accessible; even to incumbent presidents. Regardless, the APC dismissed PDP’s claims that president Buhari executed anti-people policies. APC’s National Publicity Secretary, Mallam Lanre Issa-Onilu, told Daily Sun that the opposition party is aggrieved because the system is very difficult to compromise. “Funny enough, we sympathise with the PDP for saying so. It has become obvious that their anger is because people can no longer steal money the way they did; under 16 years of PDP rule. Is it because Atiku does not have access to compromise the system the way he has been doing that made him the richest Africa on the planet earth without any visible, practical business? “He is embittered that this government has deprived him of those privileges he has been enjoying. Their position is understandable because the people Atiku and co referred to as people are the elite who are less than zero percent of the population that took all the money to buy and enjoy private jets, which they cannot afford now. It is really a pity for them.